Kick off a conference, meeting or team building day with an ice breaker and get the whole group to relax, fast. Gone are the days when team building simply involved standing up and revealing something interesting about yourself whilst going red in the face. There are some truly ingenious ice breakers out there that get people interacting without embarrassment. You wouldn't put a room full of people together and expect them to get on like the proverbial house on fire instantly. A shared hands-on exercise, game or challenge works wonders when people are taken out of their comfort zones. Below are five of the best ice breakers. These work really well as conference energisers and get brains and bodies into gear for team building days. 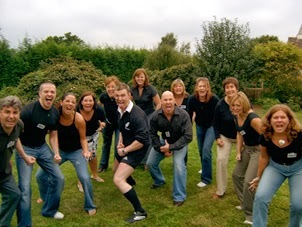 One of the most poplar ice breakers of all time, Haka is the signature dance of the New Zealand All Blacks rugby team. Learn the ancient Maori tribal dance and perform it as one big group or split into teams for a face-off. Haka is great fun and sends the adrenaline levels through the roof. Roar, stomp and blow off some steam! Simple but brilliant, this ice breaker is all about bringing different elements together in one harmonious whole. You can't help but smile doing it. On entering the room, guests take a seat and discover a pair of coloured gloves taped to the underside. Each colour represents a different action: clapping, tapping or stamping. The goal is to get everyone performing together in a symphony of rhythm and movement. It's a great way to pep people up mid-conference. Remember when you were a kid and building a rocket was the coolest thing ever? Reach for the Sky is the most fun you can have with ice breakers and is always a winner on team building days. Your mission is to build a rocket AND get it to fly to the highest point in the allotted time. Open flight cases packed with puzzles, posers and team challenges to be completed against the clock. It's a bit like Christmas in a box. Each completed challenge earns you fun money. The team with the most fun money at the end, wins. The funniest of all ice breaker activities, this one always puts smiles on faces. Can you get everyone in the team on to the seesaw without it touching the ground? Not as easy as it sounds! Call the corporate events team on 01773 766050 for more information on ice breaker activities.